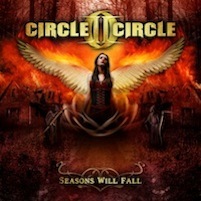 This is Circle II Circle's seventh album since 2003 and 'Seasons Will Fall' is the name of this brand new disc. Finally an album that maybe will change my perception of this band. From an average metal in the middle of the road without something new on the musical horizon, to a nice mix of catchy metal tunes that feel refreshing. More stable songs with powerful vocals from Zak Stevens and with the two guitarists (Bill Hudson and Christian Wentz) it's well outside the previous comfort zone. The connection with the old great metal band Savatage is obvious, because Zak was the lead singer in Savatage between 1992–2000 and many old fans are still waiting for the reunion, but Jon Oliva prioritises his own metal project Jon Oliva's Pain. However, 'Circle II Cirlce' has hidden some golden gems in this candy box that I appreciate a lot. 'Epiphany' is a nine minutes long epic song with strong melodies and nice guitars. I put 'End of Emotion' in my save folder - a very tasteful song. 'Dreams that Never Die' is a half progressive, half power metal track that is heavy as a lead ball. It seem that they managed to find new shades on the colour palette to paint with and the musical picture is more vivid. Like in the title song 'Seasons Will Fall', which is a stiff hard down-tempo song with stunning vocals. 'Never Gonna Stop' is a old school metal song with shining guitars. The darkest song is probably 'Isolation' and it is one of the strongest tracks on the entire disc. In the strong ballads 'Sweet Despair' and 'Only Yesterday' Zak takes the opportunity to show his wide vocal register.